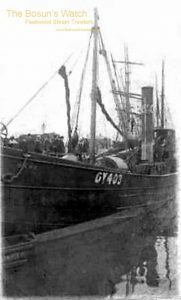 1897: Launched by Cook, Welton & Gemmell, Hull (Yd.No.193) for “D” Line Steam Fishing Co Ltd, Grimsby as DANE. 18.9.1897: Completed (Arthur Jeffs, manager). 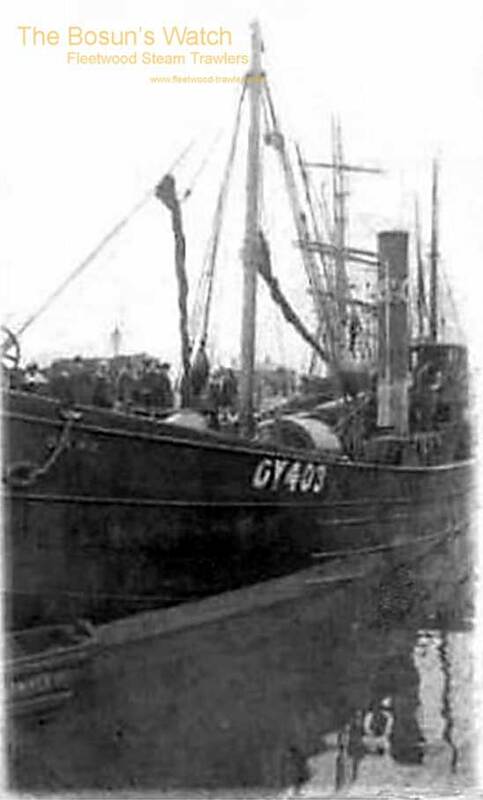 17.10.1897: Registered at Grimsby (GY403) (O.N.108480). 6.1912: Sold to N.V. Vissch. Maats. “Praxis”, Ijmuiden (J. Prins & G Carst, managers). 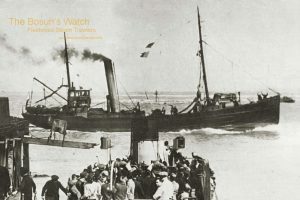 6.1912: Registered at IJmuiden as PERSEUS (IJM45). 1940s: Escaped to England and fishing from Fleetwood (Bloomfield’s Ltd, managing agents) (I.D.No.208). 1951: Sold to Dutch shipbreakers and broken up at IJmuiden. 13/03/2013: Page published. 5 updates since then. 14/01/2019: Removed FMHT watermark from image. This entry was posted in Steam Trawlers, Steamers (Picture), Wartime Visitors and tagged No Fleetwood owners, Wartime Visitor on March 13, 2013 by Fred Smith.